This adorable jumper fits 13 inch Adora Playtime Babies, and other similar sized baby dolls. This adorable pastel ensemble is really the frosting on any cake! 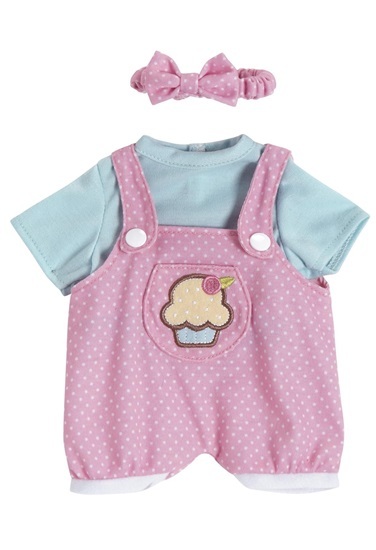 It includes pink polka dot overalls with a cupcake applique and two white button closures on the straps, a teal jersey knit top, and a matching headband with a bow. This adorable outfit is designed to fit 13 inch Playtime baby dolls and other similiar sized baby dolls.